Next to Vietnamese food, Thai food is probably our second favorite Asian cuisine to cook. 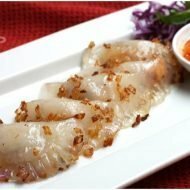 The foundation of sour, sweet, salty and spicy flavors found in many Thai dishes are similar and delicious to our Vietnamese palate. We’re fortunate to live so close to Thai Town in Hollywood where some of the best Thai restaurants in America can be found, but even so, a trip to Thai Town in LA traffic could mean an hour stuck in traffic. Who has time for that? 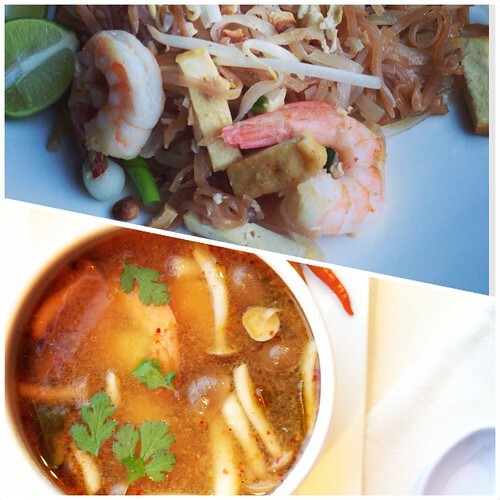 When we do cook Thai at home, Leela at the blog SheSimmers.com has always been a source of reference. When we found out she was coming out with Simple Thai Food: Classic Recipes from the Thai Home Kitchen, we had to have it. We consider ourselves beginners in Thai cooking but we dove right in and made many dishes without buying any new kitchen supplies or exotic ingredients or having much difficulty following the recipes. Every ingredient was easily found in our local Asian market. Also many ingredients such as tomatoes, galanga and cucumbers are used in several different recipes so we were able to make several additional recipes with left over ingredients. Just as the Vietnamese family meal is center around rice, so is the Thai family meal. Thus the book’s recipes are organized in dishes that are pair with rice and those that can be served alone. We love the fact that she instructs the reader to season the dishes with a more heavy hand in anticipation of eating it with bland rice. We couldn’t agree more and think it’s a common omission for beginners of Asian cooking. The flavors in the recipes were spot on and similar to what we would order at our favorite Thai restaurant. The writing, just like her blog, is fun and witty. We enjoy reading the captions for each recipe as much as making the recipe itself. We tried multiple recipes in the book and each one has been easy to follow but also simple enough for us to free lance a bit (for example, instead of grilling, we sous vide the steaks). 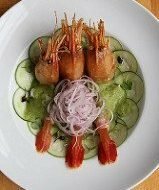 The only slight disappointment we have is that not enough of the dishes are photographed— even though the dishes and their descriptions sounds fabulous, it’s hard for words to compete with a juicy food photo. This of course may not be the fault of the author and likely had to with page restrictions, but otherwise, it’s a great collection of recipes to build our foundation into Thai cooking. 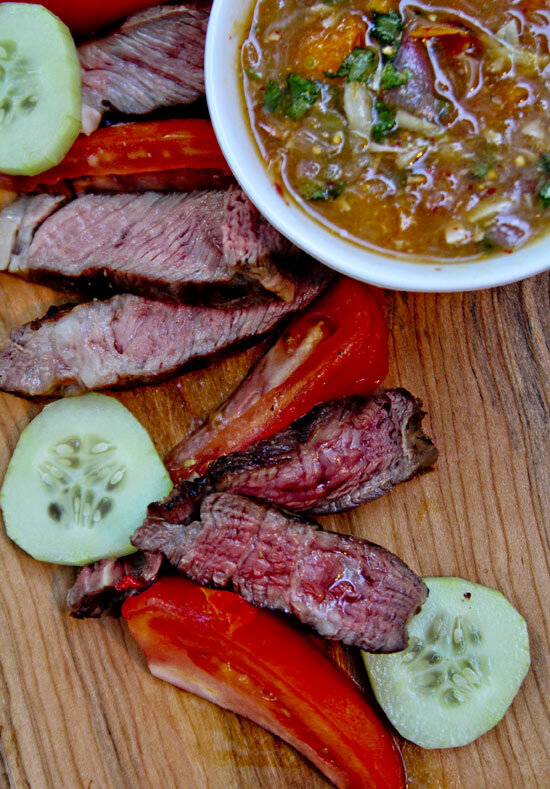 One of our favorites so far is the grilled steak with crying tiger sauce. The sauce is the real winner here. It’s so bold and versatile with it’s complex flavors and would go on any meats and even vegetables. Perfect for the summer grilling season, love it! Put the steaks in a wide, shallow bowl. Add the soy sauce, oyster sauce, oil, and pepper and turn to coat them evenly. Cover and refrigerate for 1 hour. small pieces. Add the tomatoes and cut into chunks with edge of the same spoon. and let rest for 10 to 15 minutes. around the sauce bowl. Arrange the cucumber and tomatoes on the side of the platter. Sprinkle the whole cilantro leaves over the beef and serve immediately. Recipe from Simple Thai Food, by Leela Punyaratabandhu. Disclaimer: We were provided an advanced copy. Opinions are of our own. Blue Skies and greetings from Germany! 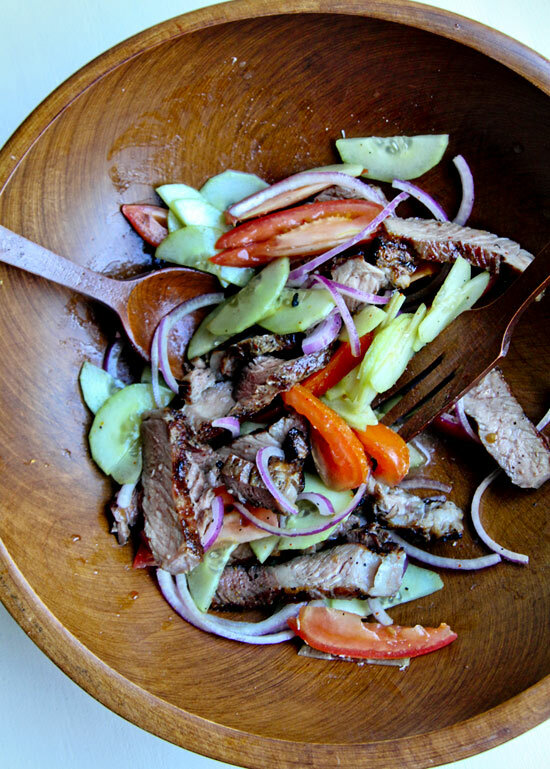 This dish is so tasty, I love the sweet, tangy and salty flavours of it. 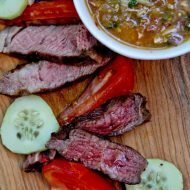 I cooked mine on a charcoal grill with a thai papaya salad. 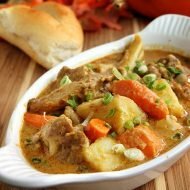 i just want to say you have shared awesome recipe with us.i can not wait to try this recipe at home. i must say dish in pic is very tasty. I just made the sauce and it was so delicious!! !